Filmmakers often ask a lot of viewers. The most common request is the suspension of disbelief, where we are invited to buy a concept which is incredibly far-fetched, such as Kevin James as The President of the United States in Pixels. We can also be expected to root for a villain or an unlikable character until they (hopefully) have the eventual change of heart. These concepts have been around for so long, we can often overlook them. But, one thing which can push the audience too far is to deprive them of answers. It's one thing to have a mystery or to be vague, but to leave people hanging is inexcusable. The Midnight After takes this idea and truly runs with it...I think. The Midnight After starts off after hours on the streets of Hong Kong. A bus picks up an eclectic group of passengers and makes its way to the Tai Po part of the city. When the bus arrives at its first stop, the group finally notices that the streets are deserted -- there are no cars, no bikes, and no other people. They debate about what to do and finally decide to meet in a restaurant. Once there, the passengers attempt to find a solution to their predicament, while they also begin to die in mysterious ways. This convinces them that there may be some sort of airborne virus at work. They finally decide to get back on the bus and attempt to find the source of the problem. You know, when I saw that The Midnight After was based on a novel by someone named "Pizza", I should have turned it off. For all that I know, the movie was written by an actual pizza. In case you haven't guessed, there are a lot of problems with the story here. The movie actually gets off to a good start. Sure, we've seen this sort of Twilight Zone-esque plot before -- the disappearance of everyone is not a new thing. However, be it the foreign location or the bizarre attitudes of the characters, this movie has an intriguing beginning. At first, we learn that the passengers are apparently the only people left in the city. Then, a man in a gas-mask is spotted. Next, the deaths begin. Following this, a mysterious code involving a famous song is found. The mysteries continue to pile up and the audience can't wait to find out what is going on. Well, you're going to be waiting a long time...as in forever. Veteran Writer/Director Fruit Chan has taken Pizza's story and stretched it out over two hours and leaves the audience with nothing. Yes, things do happen in the movie, in the second half, we get the dawning realization that it's all happening for nothing. Even the makers of Lost and The X-Files would be shocked by how things are not wrapped up here. And I don't mean just a few things -- while the characters spout some theories about what is happening, save for the fact that all other people have disappeared, we don't learn a thing. Adding insult to injury, the characters in The Midnight After are incredibly annoying. I understand that they are in a stressful situation, but the way in which they bicker and disrespect each other makes it very difficult to care what happens here. And while I've enjoyed Sam Lee's comic turns in the past, his role as a junkie, which is clearly supposed to be funny, falls completely flat. There is a distinct possibility that I'm missing a cultural factor with The Midnight After. The movie places a lot of emphasis on the various section of Hong Kong and the characters discuss where they live and where they were going on the bus ad nauseam. I've also read comments on-line that the movie is a commentary on the relationship between Hong Kong and mainland China. (And there is apparently something about Japan in there as well.) That doesn't change the fact that I can't imagine anyone being satisfied by this film. Aside from the fact that the movie is too long, it sets up a classic science-fiction twist-ending scenario and then doesn't deliver the ending. Any goodwill (and there isn't much) built up by the movie, is completely destroyed by the lack of resolution. 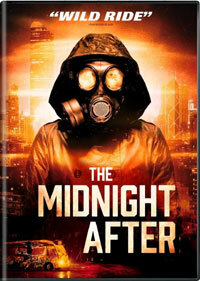 Political motivations or not, The Midnight After offers an intriguing premise which goes nowhere. The Midnight After should have come with a map of Hong Kong on DVD courtesy of Well Go USA. The film has been letterboxed at 2.35:1 and the transfer is enhanced for 16 x 9 TVs. The image is sharp and clear, showing no overt grain and no defects from the source materials. The colors look good, and although the bulk of the movie takes place at night, the image is never overly dark. The picture does have a noticeable flatness to it, but I've seen this before with foreign films on DVD. The DVD carries a Dolby Digital 5.1 audio track which provides clear dialogue and sound effects. The few action sequences due deliver some obvious stereo and surround effects, as does the opening sequence when the bus is traveling through the city. The finale offers subtle subwoofer action. The lone extra on The Midnight After DVD is a TRAILER for the film.